Dedicated « Global Market Insights, Inc. 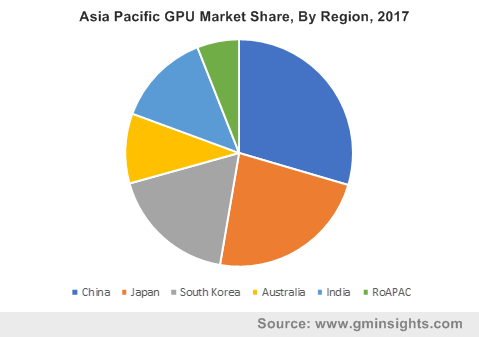 The rapidly growing adoption for high-precision, graphics-oriented applications in the automobile and healthcare sectors is certain to fuel GPU market growth in the forthcoming years. GPUs have become an essential part of today’s mainstream computers and mobile devices and have been characterized by remarkable advancements with respect to performance and capabilities. The product successfully offers added support for analyzing complex datasets in a quick manner and is increasingly gaining traction in almost all consumer electronics straight from laptops, PCs and smartphones to car infotainment systems and latest digital systems. With the growing adoption of IoT devices that gather huge amounts of data which needs to be monitored and analyzed, the demand for high-end computing systems has effectively increased in the automotive sector. Reports suggest that the GPU market will amass quite some returns from the automotive sector owing to an increase in the use of GPUs to accelerate engineering and design applications. As the automotive industry is focusing on developing new vehicles with enhanced design & functionality, GPUs have found applications in CAD/CAM software. With the rising demand for these software increase, the GPU market is expected to witness an accelerated growth rate in the years to come. Another application vertical that will help propel GPU market is healthcare, owing to the demand for precision medicine and value-based healthcare. Real-time data has become more vital for healthcare organizations as clinicians seek more accurate information for diagnosing patients during their initial visit. Reports claim that healthcare providers and life science firms are among the 92% of the cross-industry organizations that plan to invest in near real-time big data analytics applications in the future. For instance, in April 2018, tech giant Google announced plans to reinvent the healthcare industry of U.S. with a focus on big data and AI. The company is reportedly using its know-how in AI to create a new system for the detection, diagnosis, and treatment of diverse diseases, that certainly will require GPUs for processing complex data, further augmenting the growth of the GPU industry. Irrefutably, the gaming domain will be one of the most proliferating end-use sectors of the global GPU market. Mobile gaming is currently acknowledged as one of the fastest growing segments in the game industry – indeed, mobile users demand more immersive, connected gaming experience which provides high-resolution visual graphics and high-fidelity audio. Growing penetration of smartphones and tablets is also fueling the growth of the gaming industry. For instance, according to the ESAC Report 2018, in Canada around 80% users view video games as mainstream entertainment. Furthermore, reports from the Germany Trade & Invest cite that, in Germany, personal computers (PCs) stand as the most preferred gaming platforms with around 18.4M active users, followed by smartphones (17.2M), consoles (15.6M), and tablets (11.5 million). The rapidly growing use of gaming devices and the paradigm shift towards online gaming are bound to upsurge the demand for high-end graphic processors to support gaming applications. As per estimates, the gaming sector is anticipated to hold a major share of 34% in the GPU market by 2024. Some of the most preferred brands that have made a mark in the GPU industry include Nvidia, AMD, Intel, Microsoft, Google, IBM, PTC, Qualcomm, and S3 Graphics. GPU chip makers have been making heavy investments in addition to forging partnerships for developing new and better performing products. For instance, in January 2019, Nvidia announced its partnership with luxury carmaker Mercedes-Benz to develop a new automotive AI platform that could effectively offer control to the automaker’s electronic gears equipped in its new car segments. This entry was posted in Electronics and Media and tagged Automotive, CAD, CAM, Cloud, Computer, Dedicated, Design & Manufacturing, Digital Video, Gaming, Gaming Console, GPU Market, GPU Market Forecast, GPU Market Growth, GPU Market Share, GPU Market Size, Graphic Processing Unit Market, Healthcare, Hybrid, Imaging, Integrated, Integration & Maintenance, Managed Service, Modelling and Animation, On-Premise, Real Estate, Simulation, Smartphone, Tablet, Television, Training & Consulting.